Please click on one of the following or scroll down for information/applications pertaining to the following license/permits. Please note that the text below each license/permit is a summary and for complete information refer to the appropriate chapter in the City’s Municipal Code as listed below. Contact the City Hall office at (920) 674-7700 with your questions or concerns. The Operator’s License, commonly called the “Bartender’s” license, is for individuals who are 18 or older to serve and/or sell alcoholic beverages at an establishment. This license can be issued for one or two years and regardless of when it was issued, the license expires June 30th. Submit proof of either a Responsible Training Servers’ Course certificate or a license held in the last two years. If either has expired you will have to take the class again. To obtain a Responsible Training Server Course certificate you need to attend a class. The applicant can call or go online for a list of classes available at Fort Atkinson MATC (920) 563-6611 or Madison College (FKA: MATC). In addition to MATC, there is a list of websites (with approved classes) available at the Department of Revenue website www.dor.state.wi.us . The website for the class must be listed (certified) by the DOR otherwise the certificate will not be accepted. A provisional license is a temporary license allowing an applicant time to enroll in a Responsible Beverage Server Training course in order to obtain an operator license. To apply for this license you must also apply for the Operators License. This license is good for only 60 days and is not renewable. The fee is $15.00. A temporary license is issued to an applicant who is employed or donating their services to a nonprofit corporation. This license cannot exceed 14 days and can only be issued once a year. The fee is $20.00. A Temporary Class B License, or commonly called a “picnic license” allows the consumption of fermented malt beverages and or/wine coolers to be consumed at a picnic or similar gathering for a limited duration. This license can only be issued to “bona fide clubs, to county or local fair associations or agricultural societies, to churches, lodges or societies that have been in existence for at least six months….and to veterans’ organizations.” The fee is $10.00* and must be submitted, along with the application, to the City Hall office to be scheduled for a Regulatory Committee and a Common Council meeting (held first and third Tuesday’s). “Class B” wine or both. a) Event lasting less than four days please submit by the Friday before the Common Council meeting (every first and third Tuesdays). b) Event lasting more than four days the application must be filled 15 days prior to the granting of the license. The application must be filled 15 days prior to the granting of the license. * This is required to be filled out with the Special Class “B” License. There will be no exceptions for the deadlines because they are dictated by State Statutes, not the City. A Transient Merchant Permit allows individuals to go door to door (residences) to temporarily engage in retail sale of merchandise including personal services rendered. 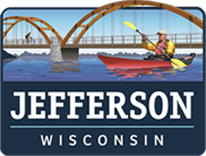 Please see the above Chapter of the City of Jefferson Municipal Code for details and for exemptions to this permit. A summary of this section is found in our Rules and Regulations flyer. The cost for a permit for up to a year time frame is $50.00. Under NO CIRCUMSTANCES will permits be issued less than a week from time of submittal of application. Also when submitting an application a color copy of identification is required. In the issuing of this license the City Hall office will do a background check on the applicant(s). This permit allows for the Sales of Goods or Services in public right-of-way. The cost of the permit is $50 (prorated monthly) and can be valid up to one year with all permits ending December 31. The vendor is only allowed to operate and be on the premise between the hours of 5:00 a.m. to 9:00 p.m. This Section shall not apply to the following events: Spring Car Show; May Ball; Cattle Fair (see §270-2); Jefferson County Fair; Sommerschlussverkauf; Gemuetlichket Days; Fall Car Show; Autumn Fest; Holiday Parade of Lights; and Santa House Hours. There is no actual “application” for Lease of City Right-of-Way. However, below is a list of information that is required before a petition can be sent to the Common Council for approval. The applicant shall execute a lease for the prescribed right-of-way containing provisions holding the City harmless for accidents or injuries occurring as a result of use of the leased premises. The lease shall specify the party responsible for the leased premises who shall be individually liable to the City for any loss sustained. The applicant shall be responsible for all cleanup after the event. Any costs incurred by the City will be billed to the responsible party. The applicant shall arrange for such traffic barriers as may be necessary to properly close the right-of-way. Such closure may include a portion of a sidewalk if at least four feet of the remaining sidewalk remains open to pedestrian traffic. The application shall be accompanied by written consent of the residents or commercial tenants of properties with frontage on the affected right-of-way and proof of comprehensive general liability insurance in a minimum amount of $500,000 for bodily injury or death and $100,000 for property damage. The Council shall specify in its approval any other conditions it deems advisable based on the nature and location of the event. The applicant shall pay a fee as set by the Common Council ($50.00). Nonprofit entities shall be exempt from the rental fee for City right-of-way as established by the Common Council beginning January 1, 2005. In lieu of the rental fee, all nonprofit entities shall be required to make a lease payment of $1 and comply with all other provisions of this section. Applicant must submit a letter explaining the reason for closure, dates and times of event along with a map showing the designated area. This license is approved by the Common Council during a regular council meeting held the first and third Tuesday of every month. In order to be placed on the agenda, the City Administrator must receive all information required, including letter to the Council and lease fee, as listed above no later than Tuesday noon one week prior to the Council meeting. There are no exceptions to this deadline and all information must be received. The following licenses are for conducting public amusement for profit. Exemptions include: public amusement(s) conducted or offered for civic, education, religious, or charitable purposes. Annual licenses may be obtained by an owner or manager of any exhibition hall, auditorium or theater which shall expire on May 1. Circuses, Menageries, and Pony or Dog Shows. Application must be submitted 30 days in advance of event. The fee is $50.00/day. Concerts and Theatrical or Musical Amusement. Application must be submitted 60 days in advance of event. The fee is $20.00/day. Merry-Go-Rounds and Other Public Amusements.